1325 Duke Street, Glasgow. G31 5PN.Tel: 01415561381. 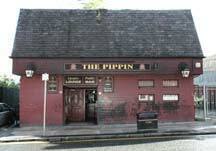 Originally known as the Pippin and opened by Tennent Caledonian Breweries in the summer of 1965. The interior consisted of the main public bar on ground level and a comfortable lounge on the upper level, the decor was finished in red cedar wood. 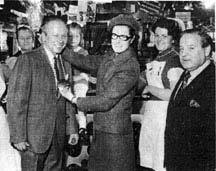 Manager Alf Daniels was well known in the area having been invested with the chain of office of the Provost of Parkhead by the Lady Provost of the city, Mrs William Gray. Left to right Alf Daniels, Mrs Gray and David Aitken, controller for Tennent Caledonian Breweries. The photograph above was taken on the occasion that more than 450 games, books, trucks and dolls were collected by staff and customers of the Pippin over three months and distributed among Glasgow's less fortunate children at Belvidere Hospital, the Royal Society for the Prevention of Cruelty to Children, the Society for Mentally Handicapped Children and the Glasgow Welfare Dept. Robert Skelton took over the licence in 1971. 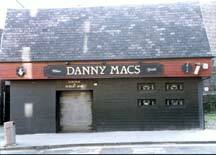 Daniel McGrain of Celtic Football Club was licensee in 1990. Update... The Pippin will soon be demolished to make way for a new tenement of flats. 2007. Exterior view of the Pippin. 2005. Members of Tennent Caledonian Breweries at the opening of the Pippin. 1965. left to right R Baxter, Glasgow Sales Manager, D H Scott, Managed houses Director, A Anderson, West Regional Sales Manager and Alf Daniels, Manager. 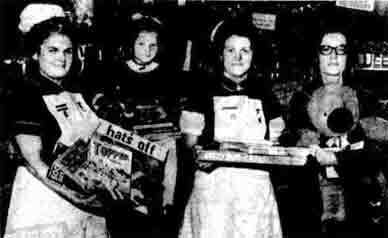 The Lady Provost, Mrs Gray (right), hands over toys for Belvidere Hospital to Nurse Margaret McAuley, five year old Diane Bell, and Nurse Patricia Duffy (left to right). Dian's mother is a nurse at the hospital. 1972. Pub gives toys for Children. Hundreds of toys gathered by a Glasgow pub were handed over for city children today. More than 450 games, books, trucks and dolls were collected by the staff and customers of the Pipin, Duke Street, Parkhead, over the last three months. And today the Lady Provost, Mrs William Gray, received the toys and presented them to Belvidere Hospital, the Royal Society for the Prevention of Cruelty to Children, Glasgow Corporation's Welfare Department, and mentally handicapped children. Mr Alf Daniel, manager of the Pipin, said, "We were quite delighted at the number of toys we were able to hand over. Everyone did extremely well." Most of the toys were bought as a result of various cash-raising ventures while others were made by customers and their friends.